“I never thought I’d be on the other side of it. Because I run. I exercise a ton,” said Domico, who collapsed in the Chillicothe school’s cafeteria Sept. 5 in sudden cardiac arrest. Thanks to the quick response and CPR skills of a teacher who had just learned it last summer and a shock from a Cardio Reviver AED device, Domico is now fully recovered. He’s in a small group since fewer than 10 percent of cardiac arrest victims survive the event nationally, according to Josh Bradshaw, community resource manager for Advanced Medical Transport of Central Illinois. 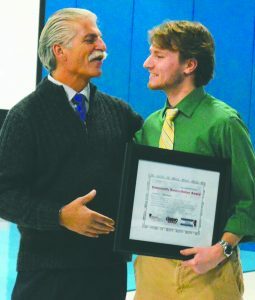 AMT, which treated Domico at the scene and took him by ambulance to a Peoria hospital, returned to the Chillicothe school recently to celebrate Domico’s recovery, recognize the efforts of junior high teacher Luke Heineman and to turn the event into a teachable moment for about 30 of the school’s students. 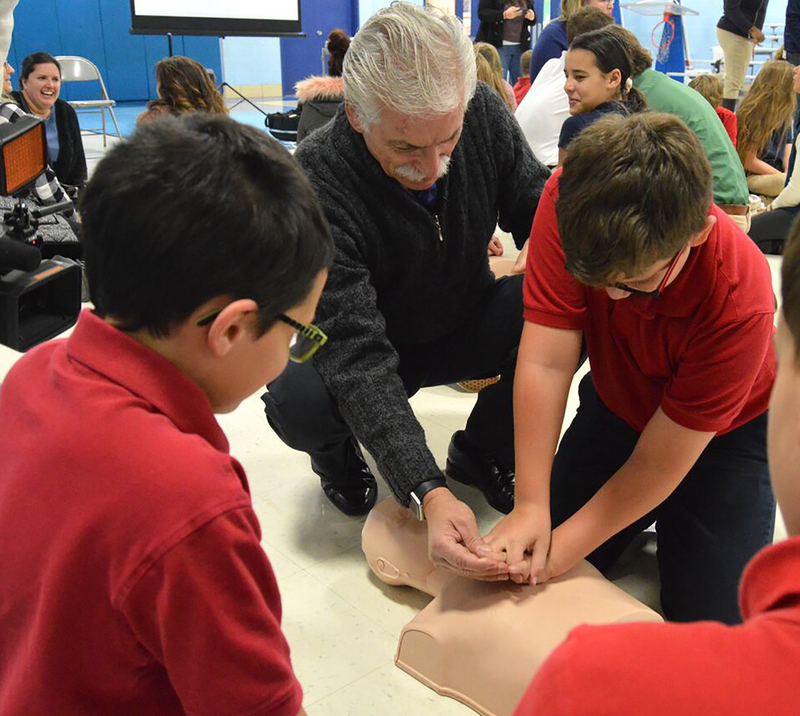 AMT staff taught the fifth- through eighth-graders, along with their teachers and a few parents, how to help a person in sudden cardiac arrest by doing hands-only CPR and using an AED. 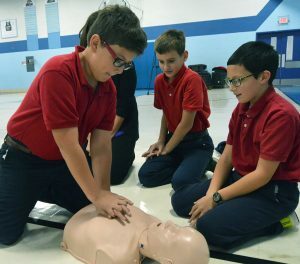 “Sudden cardiac arrest is the leading cause of death for people over 40 in America, but bystander CPR and AED application can nearly triple a person’s chance of survival,” Bradshaw told the kids before they broke into groups of three to practice chest compressions on rubber half-torso mannequins. 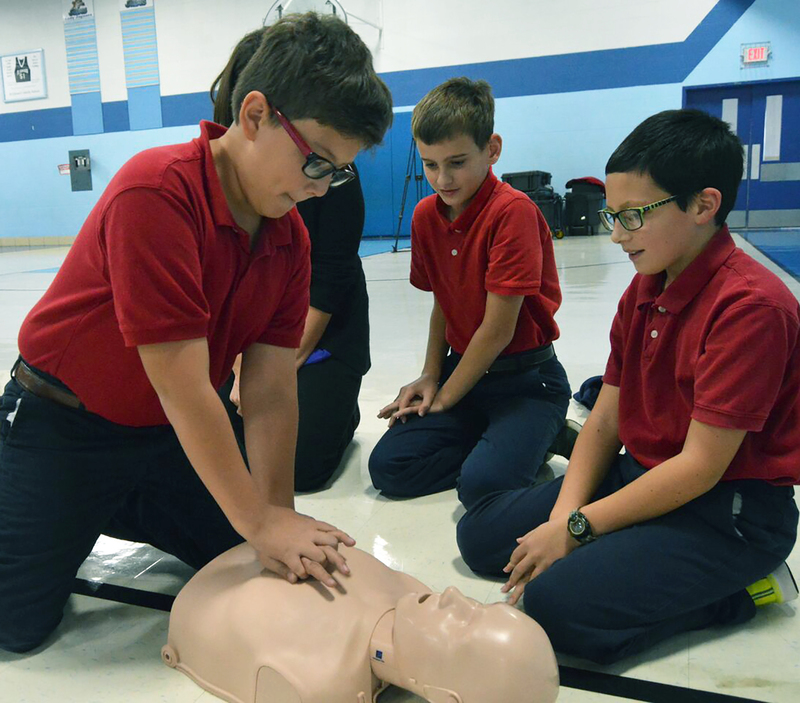 “We routinely recommend that we start teaching hands-only CPR around the fifth grade. They can do it long as they are strong enough to get the depth of the compressions,” said Lauren Emanuelson, AMT’s Race to the Top coordinator. 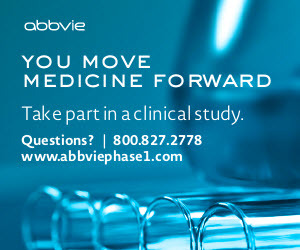 Race to the Top is the company’s strategy for achieving among the best cardiac arrest resuscitation rates in the nation. Hands-only CPR, sometimes called bystander CPR, is chest compressions without mouth-to-mouth breaths. It’s recommended for use by people who see a teen or adult suddenly collapse and has been shown to be just as effective as CPR with breaths in the first minutes of the arrest, according to the American Heart Association. The steps are simply to call 911 and then push hard and fast in the center of the chest at about 100 beats per minute. 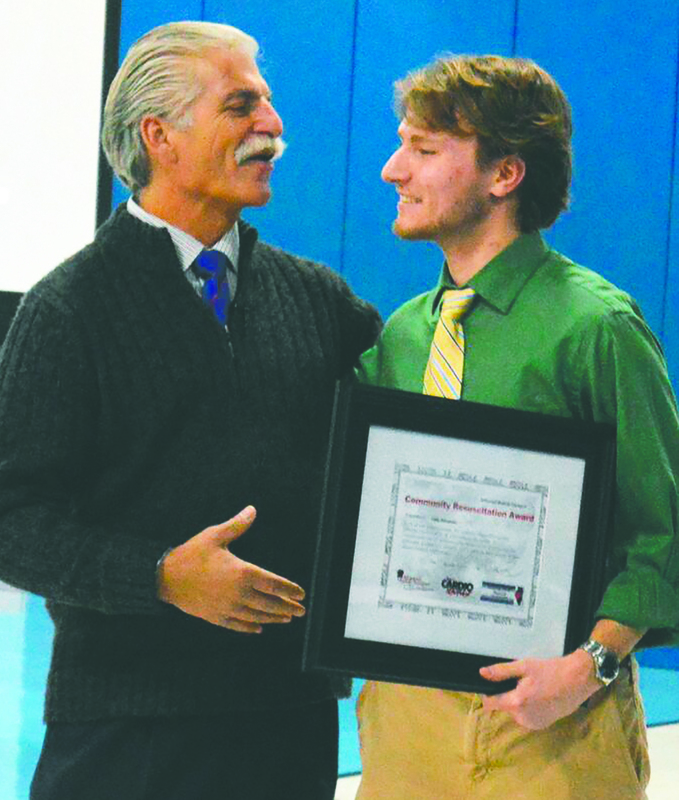 Heineman, the teacher who helped save Domico by quickly performing chest compressions, had just learned CPR two months prior to the principal’s collapse as part of a graduate program he’s completing. Domico woke up three days later in the hospital with no memory of what had happened. Domico had worked as an EMT in Metamora when he was the band director at Metamora High School from 1978 to 2002. “The AED’s first started coming out around then. We used it many times. I did CPR many times on my own, and the success rate is just not that good,” he said. Yolanda Johnson, AMT’s Cardio Reviver program coordinator, said kids typically have less fear about jumping in to help than some adults. Fifth-grade teacher—Kristal Toman, who’s already trained in CPR, was happy to see the kids learning the skill. “I definitely think it’s good for kids this age to learn bystander CPR. They can take this as a skill that they’ll continue to learn, because they know this saved a life and they’ll never forget that,” she said. AMT also donated two additional AEDs to the church and school so each building will have one. For more information about how to arrange hands-only CPR training for a school or group, contact Josh Bradshaw at 309-453-1308 or by email at jbradshaw@amtci.org.